Allyson graduated from the University of Georgia with a bachelors degree in Exercise and Sports Science as well as minor in Childhood and Family Development. From there, she went on to earn her Doctorate in Physical Therapy from the Medical College of Georgia (now known as Georgia Regents University). Allyson has worked with children in a variety of settings, including private practice, school system, hospital/acute care, home bound, and in the aquatic environment. 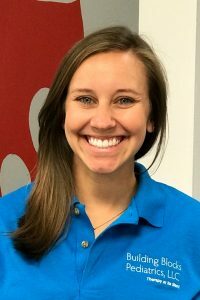 She joined the Building Blocks team in 2013 and enjoys working with children of all ages and abilities to increase their access to play and to their environment. In her spare time, Allyson enjoys spending time with her husband and son. She enjoys running, spending time in the kitchen, refinishing furniture, and cheering on the Bulldogs.